Enviable doesn’t even begin to describe the life of a style blogger—who wouldn’t love a closet full of dream-worthy designer clothing and the chance to travel the world?—but if there’s anything we’ve learned from talking to some of the industry’s leading ladies, it’s that it doesn’t happen overnight. Luckily, they were willing to share their success stories. 1. Choosing The Right Platform. It’s shifted over the years, but my perspective has always been the same: to combine beautiful photographs with my perspective on fashion, food, interior design, and beauty. 3. Picking The Right Name. This might seem trivial, but I equate a lot of my success to the title of my blog. Without even seeing the content, the name elicits a very specific sentiment, which is sweet and luxurious. I spent about a week throwing around different names until I settled on Cupcakes and Cashmere. My intention wasn't to turn my blog into a business, but simply share my interests with others. My boyfriend, Wesley Mason, helped me a lot with the design of my blog and taking photos of me almost daily with our point and shoot! What kept me going was the fact that I enjoyed documenting my outfits and reading the comments from others around the world. I did this myself at the time. I was always good at HTML and coding. My mom is a photographer, which helped immensely. We shot many looks before I started my site, because you can't launch a blog with only one post. You need to have quite a bit of content when you start, so that there is enough to keep people interested. I went to all kinds of blogger and digital media events and became friends with so many great, inspiring people. They supported me, and I supported them from the start, and we all kind of grew together. One of the most important things I did before launching my blog and channel was networking with other people in the industry and picking their brains. As simple as it sounds, I had a plan and a schedule that included what my blog/channel was going to be about and how many times I would be posting a week. I definitely utilized social tools and communities that helped to extend the sites audience reach. Bloglovin’ was, and continues to be, a top referral source. I think this came a little later after I started my blog, but I was on Chictopia and Lookbook.nu at times. I did, however, discover other bloggers through these outlets, as well as Bloglovin'. I had a big following on Lookbook.nu—around 20,000 or so—which was a lot for an online fashion following four years ago. Many of them followed me over to my blog. Although I had my blog first, it was when my YouTube channel that helped grow my blog numbers. I would upload a video and then link a blog post to go along with it. The YouTube community has had a tremendous impact on the growth of my blog. I simply wrote about the topics I was passionate about. Early on, I would post whenever I felt I had something interesting to share, but once my readership began to grow and I received feedback that people were reading on a daily basis, I created a more consistent schedule. Since every blog is different (short form/long form, photo heavy, text heavy), I don’t think there is a specific number of posts every writer needs to hit, but I think posting a minimum five times a week is a great goal. I initially had planned to do an interior design blog, but quickly switched to a personal outfit blog when my outfit photos got a better response. I post about four to five times a week. I started doing more inspirational posts and eventually converted to solely personal outfit posts. There was a time I was trying to post five times a week because I loved doing it so much, but now I see that quality is more important that quantity. I try to post about three outfits a week that are more detailed and thought out. When my site relaunches in April, I will be incorporating beauty and health sections. The key thing is to stay consistent. When I first started I posted three times a week on the blog, and one video a week on the channel. Now we update the blog daily, and the channel one to two times a week. I have a background in digital advertising, and early on I figured out the level of traffic I would need in order to match my day job’s salary (through the banner ads I ran on my site). Once I hit those numbers, the opportunity to make the blog my full-time job became a reality. My husband was fully supportive, and with his help, we mapped out a complete business plan, focusing on diversifying our revenue streams and identifying growth opportunities. It happened very naturally. I didn't have a business plan and I didn't even know that I could make money from blogging. Once I had the readership, brands started approaching me to work with them. Fossil was the very first brand that I worked with that paid me and flew me out to work with them. Because I didn't know you could make money from blogging, when they offered to pay me for a campaign I couldn't believe it. Since then, I realized with the readership I had, my blog could be turned into a business. 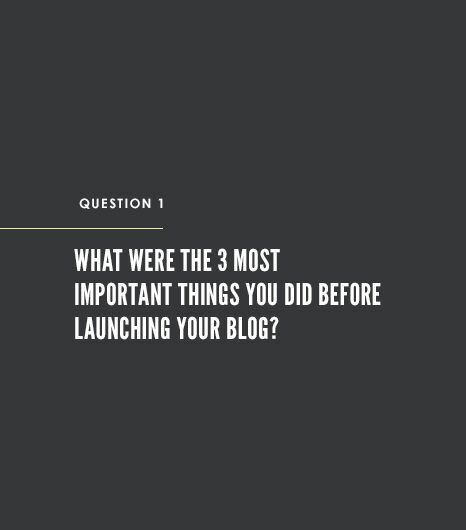 I talked to a lot of fellow bloggers with similar reach regarding monetary questions, which helped a lot. I never knew my blog would turn into what it is today. It was my hobby and what I loved to do. Once I started working with my management team (about two and a half years ago) they really helped me realize that I actually had something important to offer and that it was a business. I didn't realize what my following was worth. I definitely had a business plan. I started my blog with the intention of turning it into a business. I had my friend, and now business partner, help me draft a one-year, three-year, and 10-year plan. I use a Canon 6D ($1899) and have a bunch of different lenses—the 24-105mm, 50mm, and 85mm are the ones I use most frequently. It really depends on my mood; sometimes I like a wide-open background, while other times I like a more structured, defined façade. To be fair, we typically shoot with a very wide aperture setting, so the background is most often blurry. Great architecture is always nice. In Los Angeles, what we lack in terms of cool buildings for photo backdrops, we make up for with graffiti and palm trees. Less is more. The outfit should stand out in the photos. I love shooting with my 85 mm lens because it really blurs out the background, so you can focus on the look. It really depends on what your aesthetic is. I used to love everything backlit for an extremely dreamy and romantic photo, but the more I travel, I’m realizing how I want everything to be especially in focus. I like to show a little movement, so that the photographs look natural and not too posed. I always turn my body in a slight angle rather than facing the camera super straight. When I have pockets, I like to put one hand in the pocket. I tend to look away from the camera more often than not, and I don't smile as much as I should. My hair, which is kind of my signature look, is usually partially being flipped around in front of my face. Also, one leg crossed over the other always looks good! Stepping forward and crossing one leg in front of the other! My handbag collaboration with Coach in 2010. Three years ago I was in a commercial for Forever 21 and it played during the holidays on their digital billboard in Times Square. It was the first time I was like: “Wow I can't believe this.” Shortly after that, I got a management team and it's all been uphill from there. When I hired my first employee and got my office space! My early sites used free templates (from Blogger, then Wordpress), which I tinkered with by Googling any questions I had. I never used a professional designer until my recent redesign, which was done by my advertising partner, SAY Media. I was lucky to be dating one. I met with so many people and asked friends for recommendations. I showed the web designers my ideas and ultimately chose the people I thought best understood my vision and really wanted to work on it. That's key: a good web designer should be just as invested as you are. It's not a "job," it's art. I lucked out, as my dear friend Karla Ticas, who also takes some of my photos on the blog, is a very talented web developer! It fluctuates, but lately it’s been Bloglovin’. Facebook is second, followed by Pinterest. For me, it's Facebook and Instagram. Right now, Instagram is by far the most important social media channel for me. The reach is just so incredible. Instagram is just as (if not more) important than the blog itself. My YouTube channel and Instagram! I see Cupcakes and Cashmere continuing to evolve, from primarily an online source to more books (I’m working on my second, which comes out in spring 2015) and products. In terms of what my blog would be, I don't see it much different from what it is now. I'll still probably have outfit photos, occasional tutorials, beauty tips, and interior design inspiration. As for where I will be, I hope I'll be doing more of my interior design projects, especially retail spaces, and have my own line. If you would have asked me five years ago where I thought I'd be today, I would have never imagined this. I'm working on a lot of big projects and possibly a line of my own. I'm also working a lot as a fashion expert, TV host, and everything on camera. I see it expanding into more of a lifestyle vertical with food, fitness, and maybe some mommy tips (not that I’m pregnant now, but I do plan to be within the next five years! ).